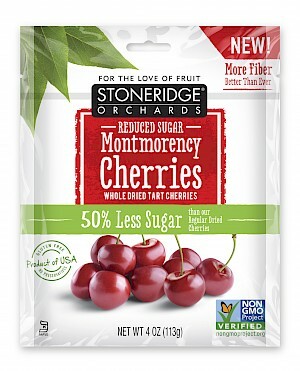 Reduced Sugar Montmorency Cherries is a HIT! These are super delicious and love the fact they have 50% less sugar. We've tasted their other full sugared version and found them extraordinary, but these are even better. Now I can eat twice as much, but there still is cane sugar and stevia added. They have also added soluble corn fiber - they say more fiber, but they don't list how much. 1/4 cup - or one-third of the package - is 130 calories, no fat, no sodium, 31 grams of carbs with 14 grams sugars, half of which are naturally occurring and no protein.